When I go flying at CDC Aviation, first there’s an online tool that allows me to view which aircraft are available and which have been booked out. The system is run in the cloud, and means that I can view the real time detail anywhere. While the previous version allowed booking through the online app, the newer version does not. That’s to protect the service from abuse. After viewing the days and times, a phone call is required through to the office, and the folks then add you to the list. Check the app below left. It includes the instructors available and their times which means booking an instrument flight session is a cinch. Bookaflight app in the cloud. Sounds aerodynamic. But that’s just the start of today’s aviation applications. 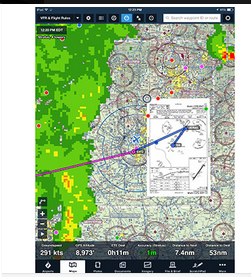 Tablets are now replacing even the trusty hand-held Garmin – although the company continues to provide data to tablets for aviators. The devices include flight plans, instrument plates, aviation maps, and weather displays and warnings. Using a tablet has great advantages over the previous GPS-based handheld systems. But they’re not a replacement for existing proper systems, even as GPS navigation systems come on line across the world – the GNSS services. Most of the apps available now are really just tablet friendly versions of existing technology, there’s nothing really new. A quick update on the law. Only a handful of airports in South Africa are GNSS legal. So don’t leave your paper charts behind just yet. The tablet is really just a redundancy. It offers a backup to your existing instruments. But like everyone flying, the GPS services are more than useful. They’ve become vital. EFB’s or Electronic Flight Bags are permitted, but if you have an incident and were found to have been flying exclusively on these services – there’s a problem with insurance for a start. 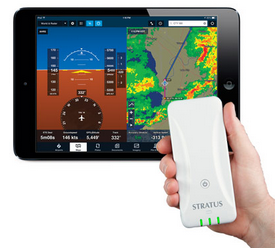 Courtesy Sporty’s – the Stratus ADS-B receiver for weather uploads to the iPad. The Flight Regulations (section 91.21 in the US for example) requires a verification procedure that ensures the system won’t interfere with your existing comms and nav systems onboard. As with all new uses, the CAA has its views and they take time to circulate. For one, you’ll need current charts uploaded to your tablet. That’s the easy part, Garmin and other services are constantly updating their charts for users and this is the advantage over print. In Garmin’s case, its every month. You’ll need to have a hardcopy chart with you as a backup. And if you’re smart, you’ll continue to scan both for signs of inaccuracies. That’s where the Cirrus scores. It already has 3 other GPS systems on board. One built into the Avidygn computer display, and two on the onboard Garmin comms and navigation hardware. So bringing your iPad along is just another computer screen to glance at. 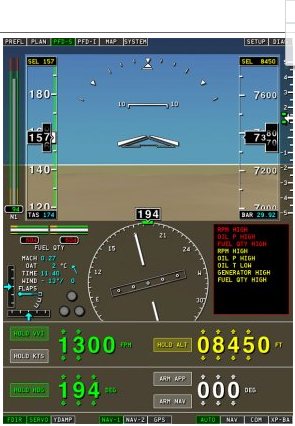 Stratus ADS-B – it’s a hefty R9000 at least. The battery life on a Tablet is around 8 hours if you’re using it to display GPS constantly. Which means its fine for general aviation – no extra power required. Just make sure your iPad is recharged. And lastly, a bracket. You need a way to lock down the tablet either on your knee, or in a heads’ up position. But the major concern when doing this is to ensure that the iPad does not affect the compass. There’s the instrument panel simulator – similar to the Garmin instrument panel which I’ve used on my handheld 196. But I’m still going to fly with a folded chart and knee board.